Zafu and Zabuton Sets are designed specifically for beginners and inflexible meditation participants. Zafu & Zabuton Sets allow beginners to reap the benefits of a relaxed, time effective, focused, meditation sessions by providing a structure no other pillows provide. The stylish, high quality design take the hassle out of tidying and finding space, as the Zafu and Zabuton Sets blend seamlessly to your décor. You no longer have to be a guru on the Himalayan Mountains to perform effective meditation. The reaching of nirvana can be achieved from the comfort of your home. Zafu and Zabuton Sets aid novices and those of a rigid disposition (you know who you are) by acting as an easy platform to practice meditation effectively. Zafu and Zabuton Sets raise the positioning of the hips allowing the meditation practitioner to balance their body in the traditional lotus position, easily. The lotus position is regarded by meditation gurus as the most effective position for meditating. The reaching of nirvana has never been easier. Zafu and Zabuton Sets lead to a more effective and time efficient meditation session. Beginners can focus their mind without worrying about posture and poise. Other varieties of pillows do not provide the support required for beginners. 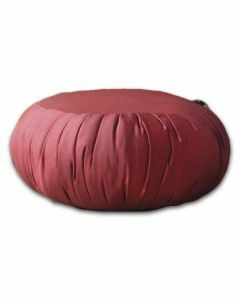 Without the proper meditation pillow, a meditation session can be extremely strenuous on the back and legs – not conducive to an enlightened mind. Tightly hand stitched fabric provides sturdy seams and a durable outer shell; the organic kapok stuffing is comfortable and long lasting, maintaining its shape for years. The transition from meditation novice to grandmaster may take time, but the Zafu and Zabuton Sets will be with you for the duration of your journey. Master Thai Craftsmen who have designed and created Zafu and Zabuton Sets for generations carefully double stitch every seam by hand. Our kapok filled Zafu and Zabuton sets provide stead-hardy support for your coccyx (the base of your spine) and is fully organic, hypoallergenic and more hygienic than any other Zafu and Zabuton Set filler. Also, once you have the lithe flexibility of a highly trained ninja the Zabuton alone can be used as a meditation cushion – saving you money and time breaking in a new cushion. No more hassle involved in tidying away meditation pillows, our stylish Zafu and Zabuton sets that not only act as a high quality meditation pillow, but also as a stylish home décor accent. Our Silklook edition Zafu and Zabuton meditation cushions are durable synthetic material with a glow of classic silk. The popular "Daily" Zafu, Zabuton individuals and Zafu and Zabuton Sets durable ticking-covered interior pads with removable and washable heavy-duty Cotton Linen covers. Premium Tatami Weave is the stylish new style that adds a contemporary style to the classic design. All Zafu and Zabuton covers have an industrial quality zipper for access to the interior pad. Well designed for yoga and various meditation practices, they're also suited to casual everyday decor and seating uses. All our Zafu and Zabuton individuals and sets are shipped from our Santa Fe warehouse. Buy today for prompt, affordable shipping!